EU ambassador adamant there's 'nothing to negotiate' on imminent discriminatory labeling, French ambassador admits political statement. 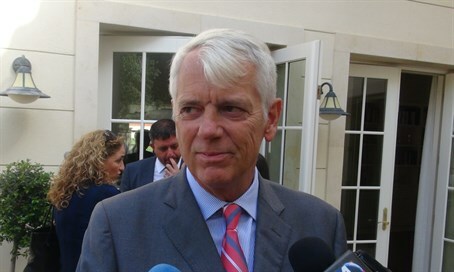 EU Ambassador to Israel Lars Faaborg-Andersen, together with French Ambassador to Israel Patrick Maisonnave, spoke to Arutz Sheva on Tuesday about the impending EU labeling of products from Jews in Judea and Samaria. Faaborg-Andersen began by saying the decision to label "settlement" produce was made back in 2012, and is now being implemented with an exact start date expected to be announced soon. When asked about Israeli pressure in response to the discriminatory practice, the EU ambassador said, "it's a technical thing, it's about compliance with our own rules and regulations so there's not so much to negotiate on that." "It's a strictly legal technical matter which doesn't really lend itself to any kind of negotiation, and I think that's the framework in which it has to be seen, rather than any political move," he added, rejecting the notion of discussing the move with Israel. Despite his talk of rules and regulations, Dutch European Union MP Bastian (Bas) Belder warned in late September that the labeling breaches international law, in an assessment that was shared by international legal expert Professor Eugene Kontorovich of Northwestern University. Kontorovich said that the EU was discriminating against Israel by singling it out and ignoring other disputed areas in labeling, such as the Western Sahara, which Morocco is occupying while exporting a large amount of fish products to the EU. Maisonnave echoed the EU ambassador, telling Arutz Sheva on Tuesday that the labeling is a matter of implementing law. "At the end of the day it's a matter of implementation of European law, but also the information that has to be provided to the European consumer," he said. When asked whether beyond implementation there is not a statement in the move, he acknowledged, "there is a statement, I mean everyone knows the position of the European Union regarding the settlements so it's a kind of consequence of this well-known European position." When asked about the economic harm that the labeling is anticipated to inflict against Palestinian Arab workers at Jewish factories, Maisonnave stuttered around the question before saying, "if I consider that the role that the products of these settlements play in the Israeli economy, I can imagine it will not harm the Israeli economy much." The French foreign minister appeared to be trying to play down the economic damage threatened by the move singling out Israeli products from Judea and Samaria, and dismissing its potential impact on Arab workers. Along the same lines, Faaborg-Andersen said, "it's a question of whether you are talking this up or talking it down, and there the issue is what context do you see it in. We see it in a predominantly technical context and therefore we think that it's really not something that ought to create a major rupture in our relationship (with Israel)." "That is our point of view, others may have a different point of view, but nevertheless that remains our view." Regarding the legality of Israel's presence in Judea and Samaria, and consequently the legality of products from there, the 2012 Levy Report proved that Israel's presence in its Biblical heartland is completely legal according to international law. However, despite being commissioned by Prime Minister Binyamin Netanyahu, the coalition government has yet to adopt the report.